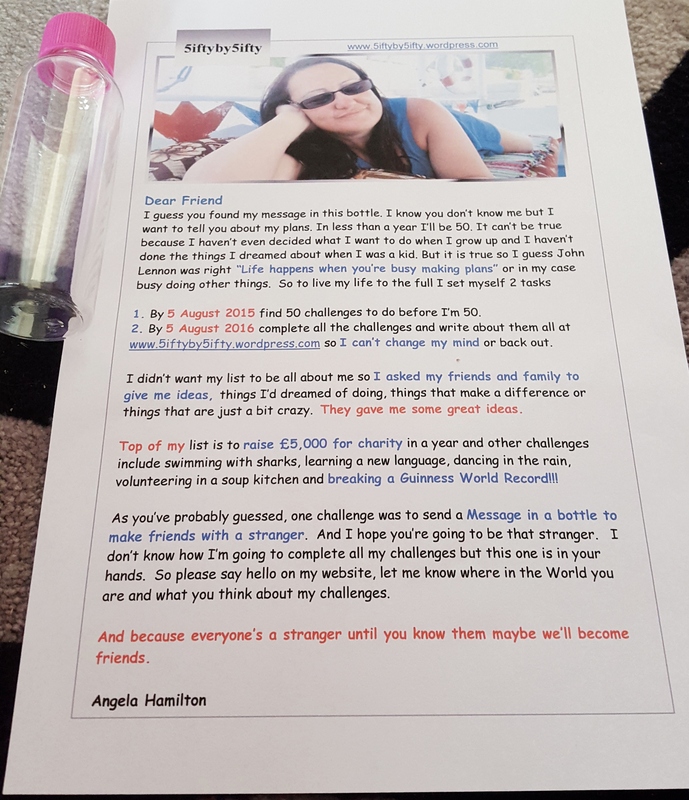 Challenge number 41 was to send a Message in a Bottle to make friends with a stranger. I wanted this to be one of my first challenges and decided to do it on day one. 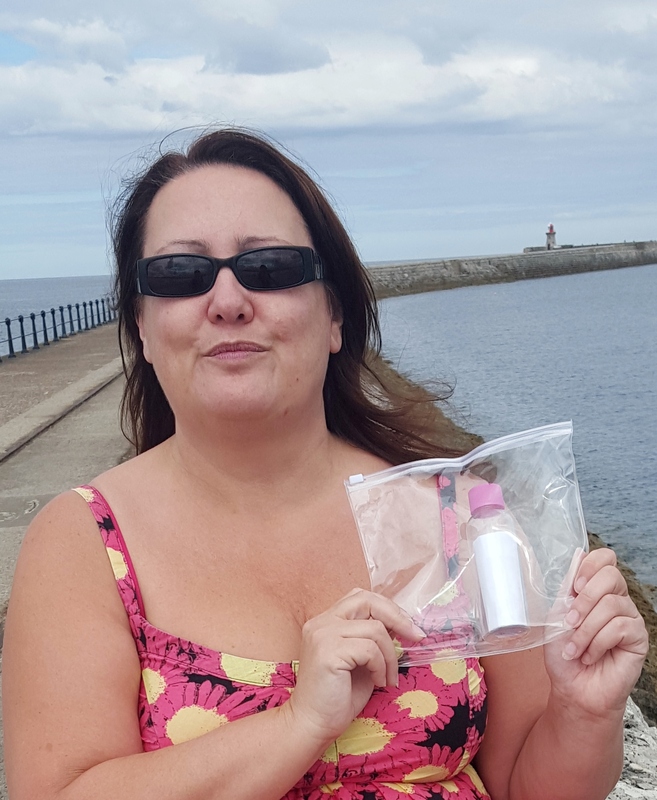 I live by the beach so all I had to do was write a message, put it in a bottle and drop it in the North Sea. Surely it couldn’t be that difficult. Well it certainly proved harder than I thought it was going to be. What should I say? Do I use a glass bottle or a plastic bottle? How do I stop the paper getting wet? 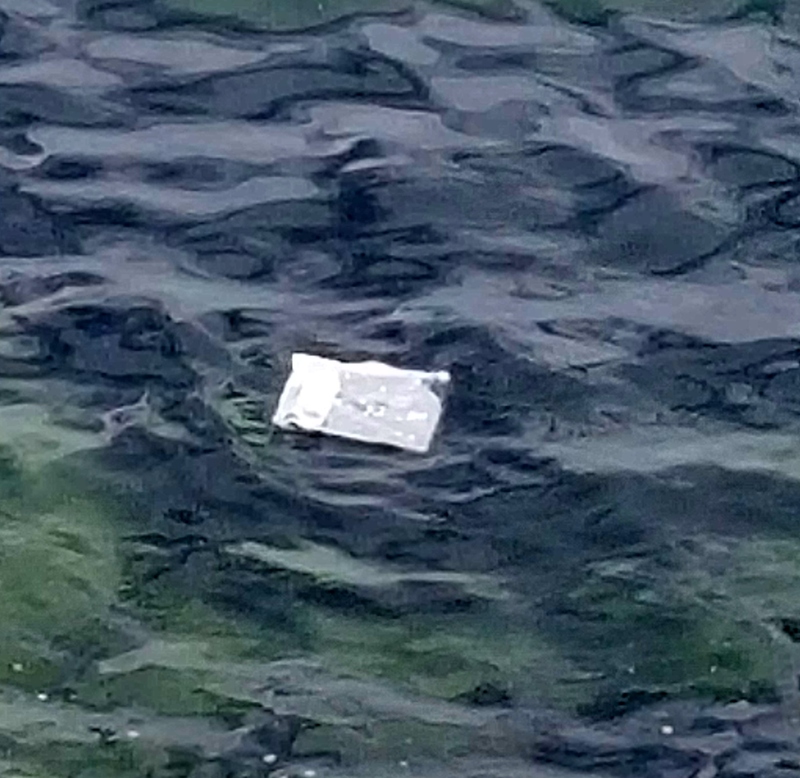 Is even legal to send a message in a bottle? So I turned to the trusty old internet to try and find some of the answers and I came across a website that gave me step by step instructions along with pictures. The Message: The internet couldn’t help me here. This one had to be all my own. If I want the person who finds it to become a friend then it needs to be interesting. I can’t just say hello, my names Angela, please let me know if you got this message. I need them to want to get in touch or I’ll never know what happened to my message. So after a few attempts I decided to tell whoever finds it about 5iftyby5ifty. Hopefully the idea of finding out if the middle-aged woman, who really should know better, actually managed to swim with sharks, walk on fire and raise £5,000 for charity. So with the letter finally written all I needed was a bottle. The Bottle: Apparently it doesn’t matter what kind of bottle you use. Most people tend to use a beer bottle but whatever you choose you have to make sure it’s clean and dry. The website also recommended sealing it in a plastic bag to stop it getting wet. So I chose a bottle (water as I don’t drink beer), washed it out and left it to dry. Two days later with drops of water still clinging to the side I decided to try and dry it out with a hairdryer and to say I’ve had better ideas is the understatement of the year. The water began to dry up quickly but then the bottle started to melt and although it toughened up again when I turned the heat off I couldn’t get the lid back on. So I cheated. 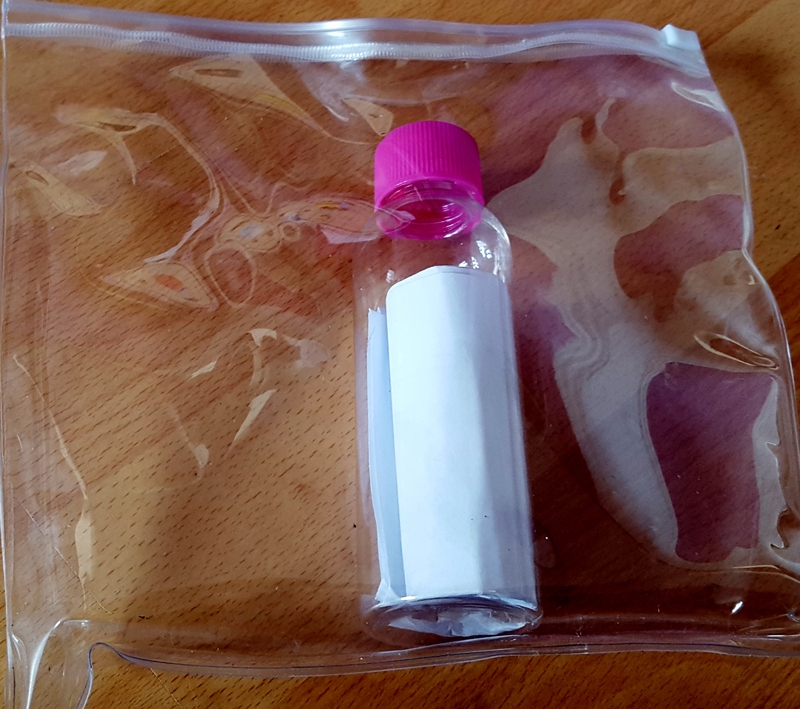 I went to the shop, bought some travel bottles in a sealable bag and popped my message in. The right side of the law: The World Wide Web is a fantastic invention but it sometimes it causes more problems than it solves. A friend mentioned in passing that I should check out if it was legal to send a message in a bottle or if it would be classed as littering. So back to the internet I went and it turns that in some Countries it is illegal but I couldn’t find anything about the UK, except lots of other people like me asking the questions. I’m not advocating throwing rubbish in the sea in fact that could be against the law but my message has a purpose so it isn’t rubbish so I think I should be ok.
Bon Voyage: I love South Shields (my home town) but as anyone who has been to the North East of England will know, even in the summer, the sun doesn’t shine every day so you have to take advantage when it does. So with the sun in the sky, the wind little more than a breeze and no sign of rain my son and I set off down to the beach today with bottle and bag in hand. My idea was to paddle a little way out into the sea and let the bottle go but that wasn’t to be. When we go there the beach was full of families enjoying the weather and children playing in the sea and I wasn’t really sure I wanted them all watching me and thinking I was maybe a little crazy. So instead we walked along the pier, not right to the end, just about half way. Then after climbing up onto the wall and sealing the bag with a kiss for luck I threw the bag as far as I could into the sea. We sat for five minutes watching it float off and that as they say is that. 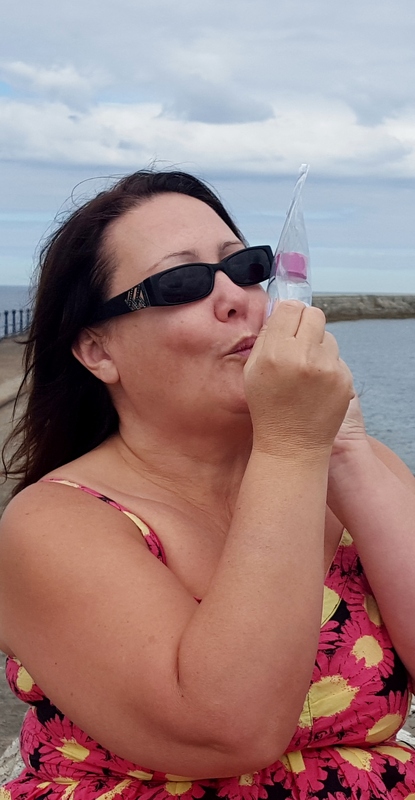 101 years is the Guinness World Record for a message in a bottle – It could be a long wait!! !